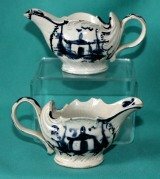 Very Rare English Pearlware Jug (Possibly Swansea) c.1790-1810, printed in blue underglaze with "Chinese Adults"* pattern. 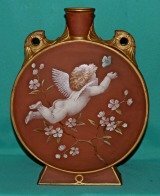 Dimensions: 20 cm high. Unmarked. Condition: Chips and a small hairline around the spout. 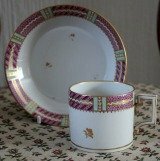 * This pattern is very similar to a New Hall pattern where the figures are round headed children, known as "Chinese Children" (see "New Hall Porcelains" by Geoffrey Godden, page 298, plate 268). 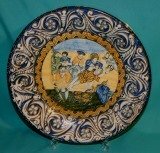 A Rare Minton Pearlware Meat Dish/Platter c.1810, transfer-printed in black with a version of "Greek" pattern, the border with masonic symbols. 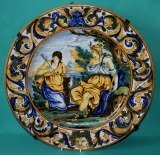 Dimensions: 28 cm x 37.5 cm. Condition: a tiny 4 cm hairline near the rim. Unmarked. 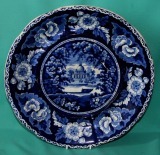 A John Denton Bagster Warming Dish c.1820, blue-printed in the "Vignette" pattern depicting rural scenes within a broad flower and scroll border. 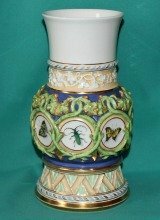 Dimensions: 25 cm diam x 5 cm high. fine condition, just a tiny chip on the spout. 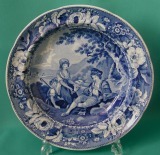 Printed marks in blue: "VIGNETTE IDB" on the base. 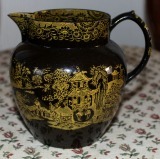 A Leeds-Swinton (Brameld) Brown Stoneware Jug c.1790-95, transfer-printed in bright yellow under glaze with "Two Figures" pattern. 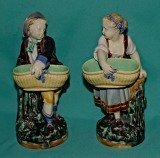 Dimensions: 11.5 cm high. Unmarked. Fine condition. 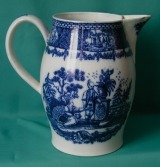 * An identical Jug is illustrated in "Rockingham 1745-1842" by Alwyn and Angela Cox, page 71, fig. 46. 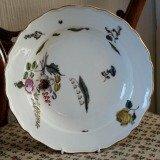 A Minton Pearlware Armorial Dinner Plate, c.1820, transfer-printed in blue underglaze, the border from "Chinese Marine" pattern and the center with the Arms of the Worshipful Company of Ironmongers, one of the Livery Companies of London, incorporated under Royal Charter in 1463. 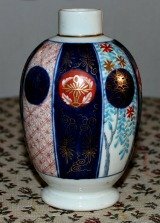 Marks: blue star on the base. Condition: several small chips and some staining on the back. 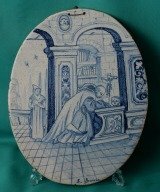 A Rare Staffordshire "Father Mathew"* Temperance Slop Bowl c.1830-40, (possibly by Adams), pearlware body, transfer printed in brown with scene of preacher speaking to group of men and women in outdoor setting with inscription above The Great Advocate For Temperance Father Mathew, surrounded by vignettes of bee skep (hive) with Temperance and Industry/Industry pays Debts which are repeated on interior. 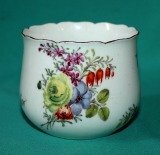 Dimensions: 14.5 cm diam x 7 cm high. Marks: Printed "3" in black on the base. Condition: A hairline crack. * Father Theobald Mathew (1790 - 1856) was a celebrated Irish cleric who dedicated his life to saving the poor from drink. He preached much in Ireland, then in Liverpool, Manchester, London, and also in the United States. 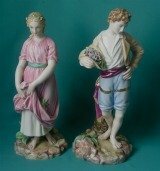 A statue of him was set up in Cork (c1860). 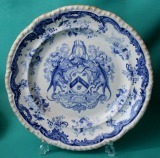 A Minton Pearlware Dish of unusual shape, blue printed with "Monk's Rock" pattern, c.1815. 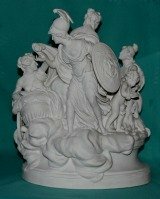 Dimensions: 22 cm x 15 cm x 7 cm. Excellent Condition. Unmarked. 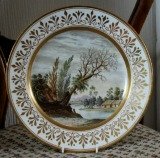 An early E. & G. Phillips Pearlware Plate, transfer-printed in underglaze blue with the "Pastoral Scenes" pattern c.1825. 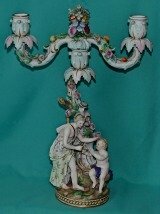 Dimensions: 22 cm. diam. Fine Condition. Unmarked.